Because I don’t like to wait around for other people, it is very rare to find us on any sort of tour ourselves. We prefer to travel at our own pace. In addition, we often find tours to be mundane and peripheral, not diving into a place’s authenticity or character. And I just hate if I am on a tour and the guide brings me to his buddy’s souvenir shop. But if you can create a tour that doesn’t feel commercialized and touristy, that actually offers in-depth information you never would have had access to otherwise, then you’ve struck gold. And we get really excited. 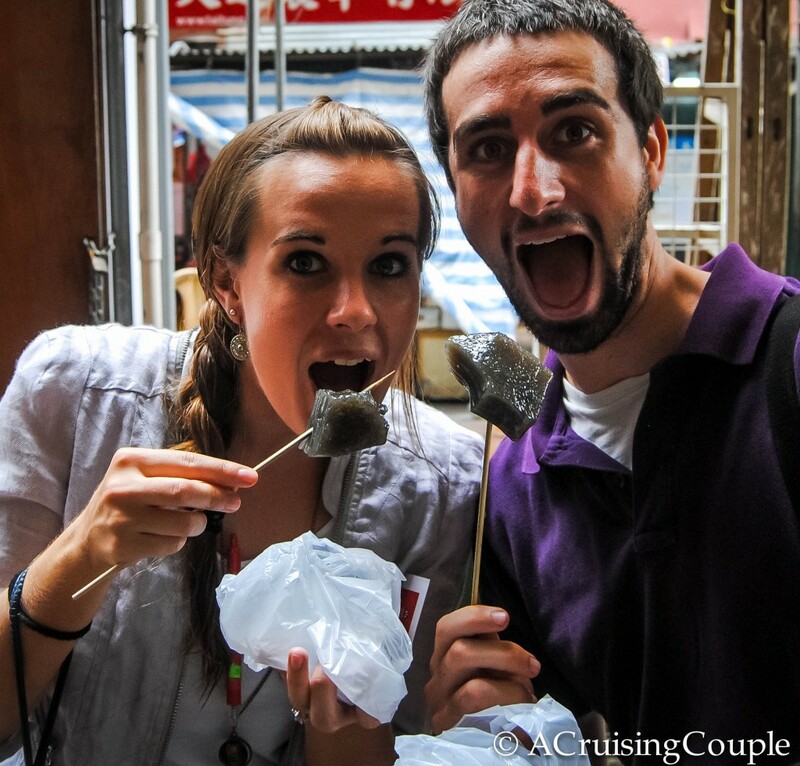 Hong Kong Foodie Tours is exactly the latter: an in-depth tasting tour that introduces the unique and authentic flavors of Hong Kong to participants from around the world. And what better place to experience a tasting tour than in Hong Kong, a utopia for devoted foodies. Ranging from street food to cosmopolitan restaurants to world-famous din sum, it’s not likely you’ll be going hungry at any point during your time in Hong Kong. 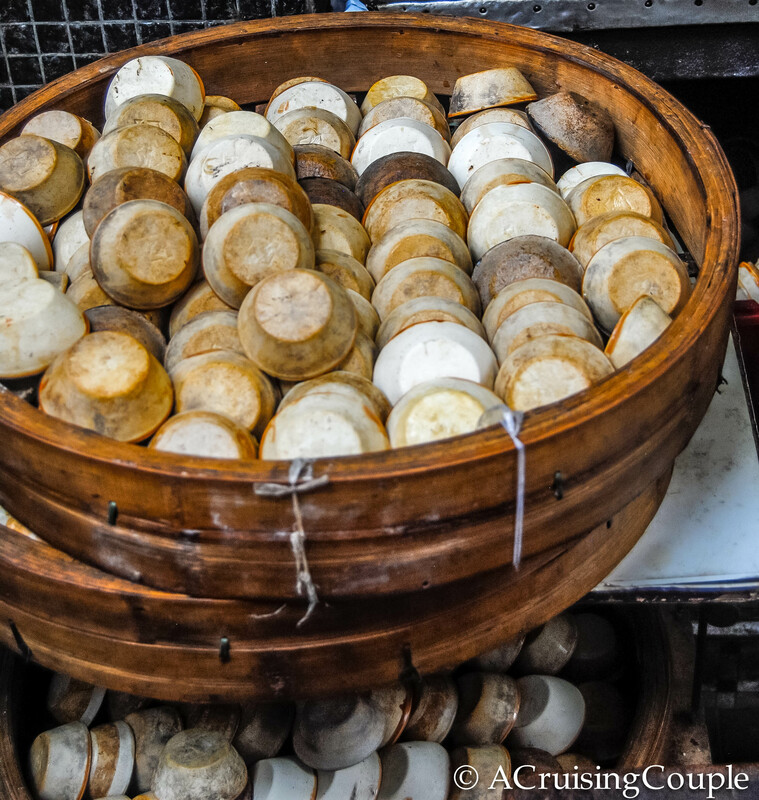 When we heard about Hong Kong Foodie’s new tour through the Sham Shui Po district, we just knew we had to include it on our itinerary. Sham Shui Po, a working-class neighborhood in Kowloon, has escaped much of the reclamation and redevelopment so common elsewhere in Hong Kong. 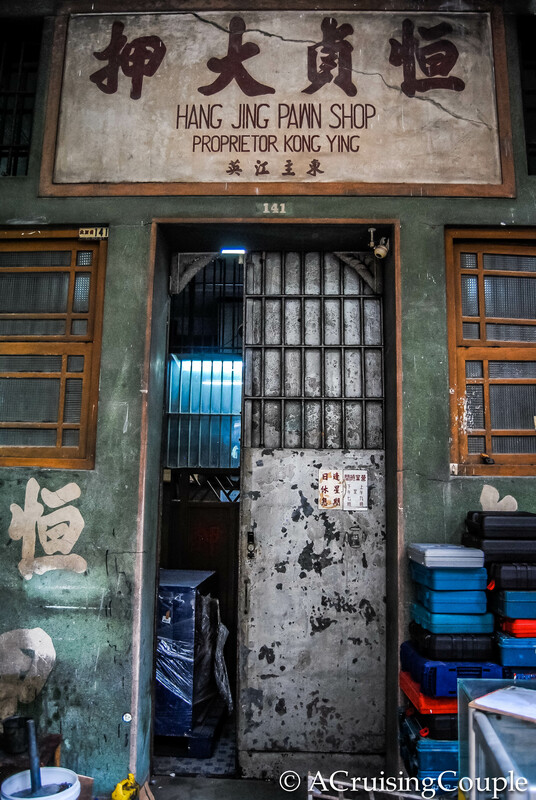 While a handful of tourists might make the trek out here for the clothing or electronics markets, only the locals know that it is a foodie’s dream come true—an enclave for good eats and genuine Cantonese cuisine, with the perfect serving of history, architecture, and culture on the side. Upon tour day, we met our guides, Cecilia and Silvana, bright and early. We were immediately struck by their cordial and relaxed dispositions, setting a friendly tone that would continue for the duration of the four-hour tour. With big appetites in stow, it was time to begin our tasting. 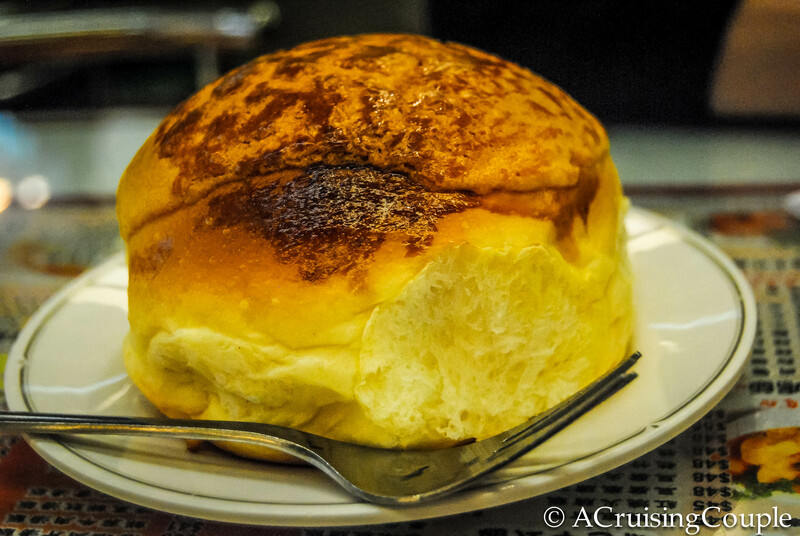 Our first stop was a small and crowded Hong Kong style café for some pineapple buns and milk tea. Pineapple buns derive their name from the checkered appearance on top of the bread, resembling that of a pineapple’s skin; however, no actual pineapple is contained in the recipe. The bread is soft and fluffy, but it’s the crispy sweet topping that steals the show. It’s no wonder the restaurant makes over 300 pineapple buns daily. Of course, no pineapple bun is complete without a cup of milk tea. 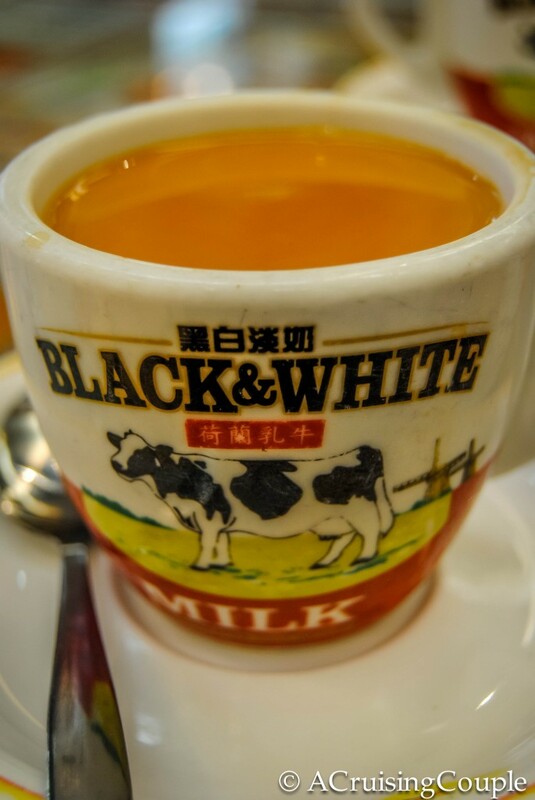 Influenced from British colonial rule, Hong Kong style milk tea is smooth and rich, a mixture of black tea and evaporated milk (preferably Black and White). The flavor is strong, and surprisingly different from the popular milk tea drinks in Taiwan. After filling up (perhaps a bit too much) on breakfast, we continued on for some Put Chai Pudding. The gelatinous treat gets its name from the small clay bowls used to mold it, and consists of yellow sugar and red beans. Although normally I’m not into mixing savory and sweet—a practice the Chinese love—I was actually quite a fan of these small chewy snacks. We were taught the correct way to stab the pudding with our sticks, although admittedly I struggled to make pudding-to-mouth contact on multiple occasions. To complement the Put Chai, we also tried a Sesame Pudding. The texture was similar to the Put Chai, although the taste was less sweet. Wisely we enjoyed a few bites before deciding to save the rest, and our appetites. Walking in the heat had us sporting beads of sweat, but luckily the next stop was a thirst-quencher: soybean milk. Although we’ve tried soybean milk before, this was the first time we could sip on the slightly bitter beverage while watching the process behind it. The friendly manager eagerly invited us to the back of his store to explain the process of grinding and boiling the beans down to milk, and insured us that only Canadian organic soybeans are used. Honestly I was more impressed that he operates his store from 6am to midnight each day. At this point we had walked our way from breakfast to lunch; it was now time to sample some braised goose and pork knuckles. It takes the small restaurant two hours to properly prepare the goose, but the results are sublime. The meat was juicy and tender, the sauce unlike anything we had tasted before. This was our first time to try pork knuckles, and while initially the name turned us off a bit, we were surprised to find we quite enjoyed the taste. The pig knuckles were served cold, the goose hot, and both with a classic side of white rice. Our stomachs were filling and our appetites dwindling, but we couldn’t help but keep at the delicious grub before us. That was, until our guides mentioned cookies. Then we suddenly found the will power to pull ourselves away. Our following destination has been in operation since the 1940’s; previously a full-fledged restaurant, now it remains as a cookie shop. Boxes of sweets lined the perimeter, including exotic flavors such as red bean and lotus. We sampled the traditional walnut and almond cookies. Light, powdery, and not too sweet, they crumbled in our mouths upon the first bite. While delicious, the cookies ended up taking a sideline to the staff when a lovely old woman, perhaps in her 80s, took it upon herself to teach Dan a bit more about photography. Apparently she wasn’t pleased with Dan’s photos of her co-worker, and explained a bit in Cantonese how Dan should in fact be taking photographs. I’m not sure she has ever held a camera in her hands, but no matter. She was adorable and opinionated and we loved it. The final stop on our tasting spree was now just a few steps away. High expectations set in as we scanned the photos of celebrities who had eaten at the small, family-run establishment. This eatery has also been around since the 1940s, and it is now owned and operated by the founder’s third generation. It truly doesn’t get more family oriented than here. The mother can be found in the shop, where she sets up camp to make the restaurant’s dumplings. The father stays at home to make the noodles, where he sits on a bamboo stick and uses his body weight to rhythmically bounce the stick back and forth across the dough, kneading up to 50 kilograms of egg noodles a day. This is one of the last noodle shops in Hong Kong that uses such a technique, and the end result is a light and bouncy noodle. 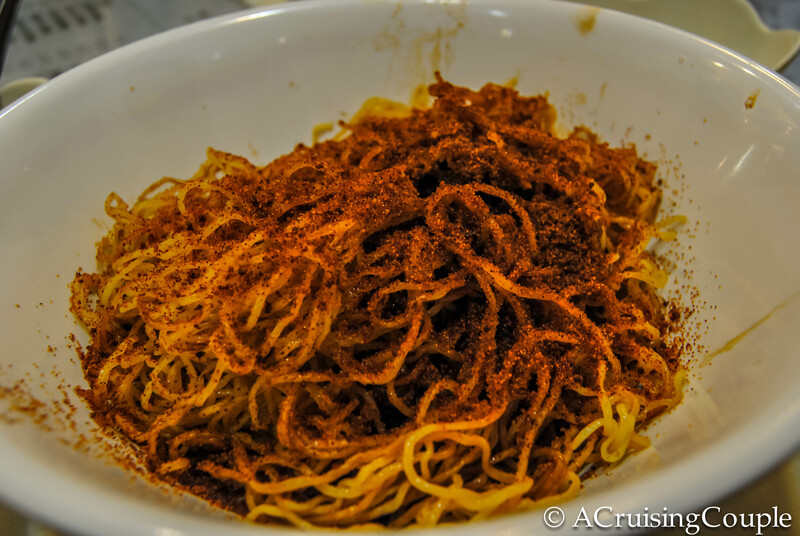 We finished off our feast with the egg noodles covered in dusty and fragrant shrimp roe. Another dish I would never have ordered on my own, but I’m so glad to have tried. I think I might have gained ten pounds visiting those six establishments; needless to say, the food was phenomenal. But it wasn’t just the delectable cuisine at small, family run establishments, holes-in the wall we would never have noticed, that made our Hong Kong Foodie Tour so memorable. What turned a flavorful morning into an enlightening experience were the conversations we shared with our guides, Cecilia and Silvana. Along the way, the lovely ladies told us about Sham Shui Po’s history. How it used to be a pier, which is why the name translates to ‘Deep Water Pier’. About the impact that factories had on the community, hence the proliferation of button, zipper and ribbon stores. 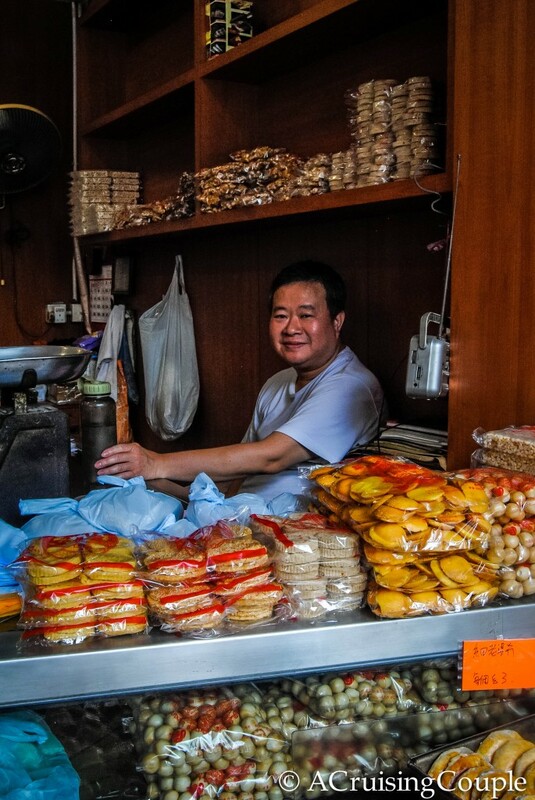 We learned about mahjong and pawnshops and Hong Kong’s number one street-food, egg waffles. 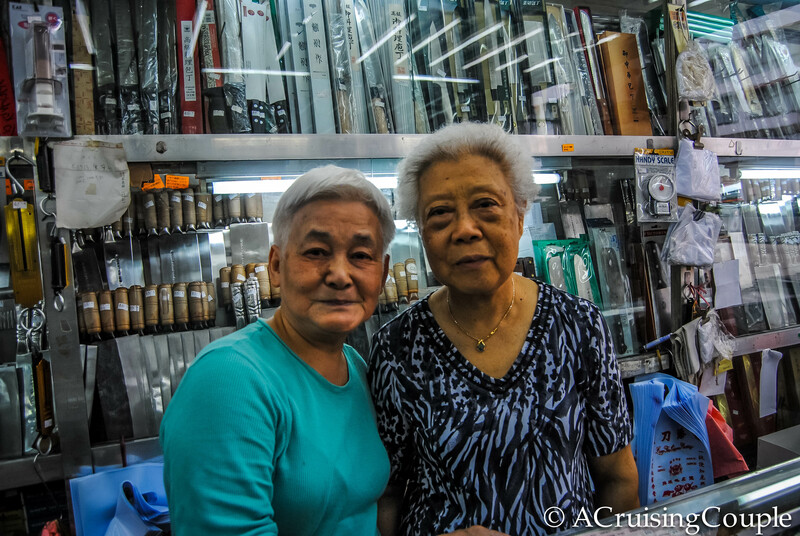 And as if that wasn’t enough, Cecilia and Silvana walked us through markets, explaining to us the variety of noodles, dried fish and even remote controls on display; imparting information only a local would know. We learned more about Hong Kong’s culture in those four hours than we did the rest of our trip. Believe it or not, there’s still more: Cecilia and Silvana were more than tour guides—they related to us on a personal level. In between talking about food, culture and history, we also chatted about traveling, running and being expats in Taiwan. They resonated with us, and from beginning to end, we never felt like we were part of an organized tour; rather, we continually thought of our guides as extremely knowledgeable friends, showing off their favorite spots in the city. 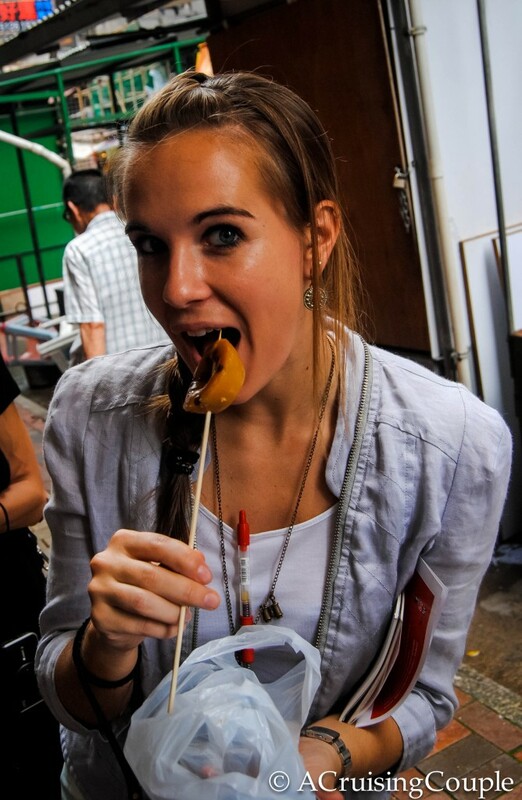 We highly recommend participating in one of Hong Kong Foodie’s tasting tours upon your next visit to Hong Kong. 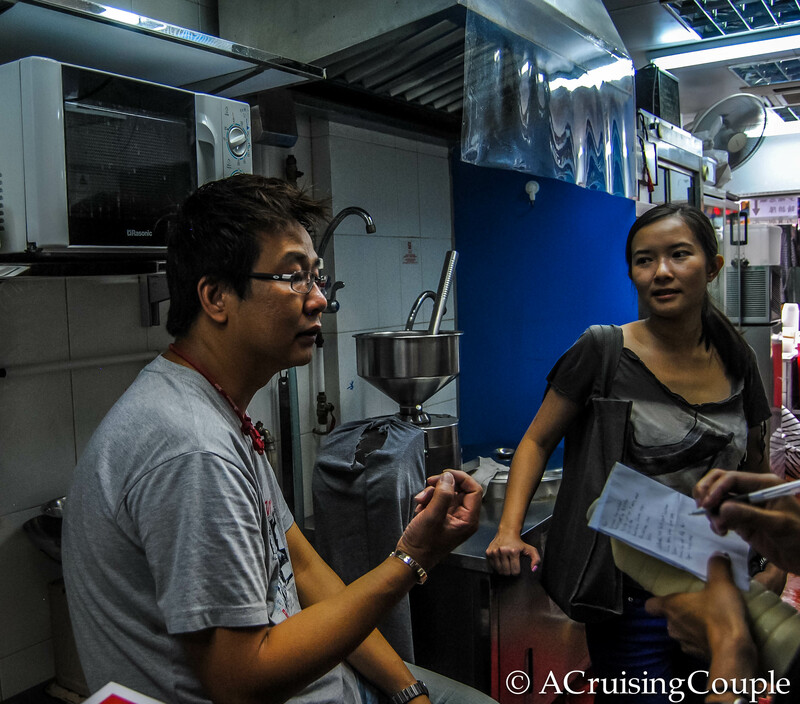 The tours last about three hours and 45 minutes, and cost HK$690 per person, including tastings. To book contact Hong Kong Foodie Tours (00 852 2850 5006; www.hongkongfoodietours.com) or check out their facebook page. Have you tried any of these Hong Kong specialties? What was your most memorable or favorite food abroad? A huge thanks to Hong Kong Foodie Tours for having us on their tasting tour. As always, all thoughts and opinions remain our own. Just finished eating but I could definitely find some room for these delicacies! Wow, what a great set-up and I love the anecdote about the old lady bossing Dan about. If I make it to Hong Kong, I will make sure to look these guys up! Oh yum, that all looks so tasty! What a great tour-you can learn about the people, the food and stuff yourself at the same time. Delicious food and learning about it’s history, what’s not to love!?! Foodie tours are my FAVE! As you said, you really get to know so much about a culture by exploring their customs through food! Milk tea is my go-to everytime I’m in (NYC’s) Chinatown…I’ll definitely be on the lookout for some of these other goodies! If you want to learn about culture there’s a good chance you can find it in the food. If people have been doing anything in an area for a long time, it’s eating. :-p Thanks for stopping by! I’d love to try the almond and walnut cookies, the sesame pudding and the pineapple buns, they all look delicious! I was wondering if there was a vegetarian option for the lunch? They are super yummy! And yes they can definitely help you out with a veggie option for lunch. There is so much good food in HK there is something for everyone. ;-) With the Buddhist culture there’s a lot of tofu and soy-based products. Although I’ve been to Hong Kong so many times, we never went for this tour. We definitely to catch up. I simply love the food in HK as it’s so different from Chinese. Agree with Franca, I’d love to try the almond and walnut cookies and those pineapple buns are just way too good!! The food in HK is such a huge part of the experience. The cookies are good but I think the pineapple bun was at the top of the list for me. Do you prefer it with or without the frozen butter slab inside? This sounds soooooo good! If we had known about it, we definitely would have considered doing it as it looks like the guides really put you in the path of some great local delicacies that the average tourist would be really unlikely to uncover on her own. 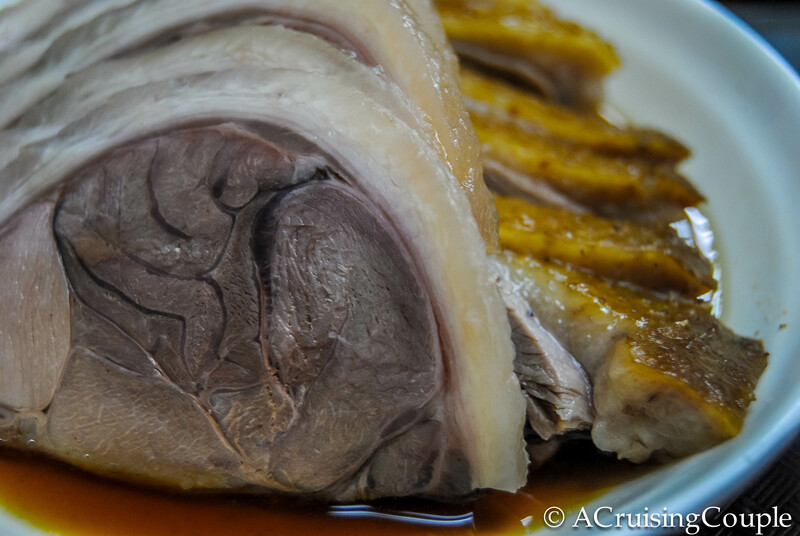 We really wanted to try goose while in HK because we knew it was a specialty, but everything we read suggested the best places to get it were way out in the northern provinces, so we wound up skipping it. Plus, if we had taken this tour, we might have known that pineapple buns actually have no pineapple and saved ourselves a lot of disappointment… that’s right, we bought some and then were so sad to discover there was no fruit to be had! YAY! So glad you enjoyed it. Definitely check out Hong Kong Foodies if you’re in Hong Kong soon-it was a highlight of our trip! Thanks for stopping by! Wow everything looks so good, I will definitely take this tour next time I’m in HK, would you say you ate a lot more street food or in restaurants while you were there? Thanks Jordan! It was certainly delish :) I would say it’s about half and half, but all the restaurants are very small, mom and pop places, with no English menus. 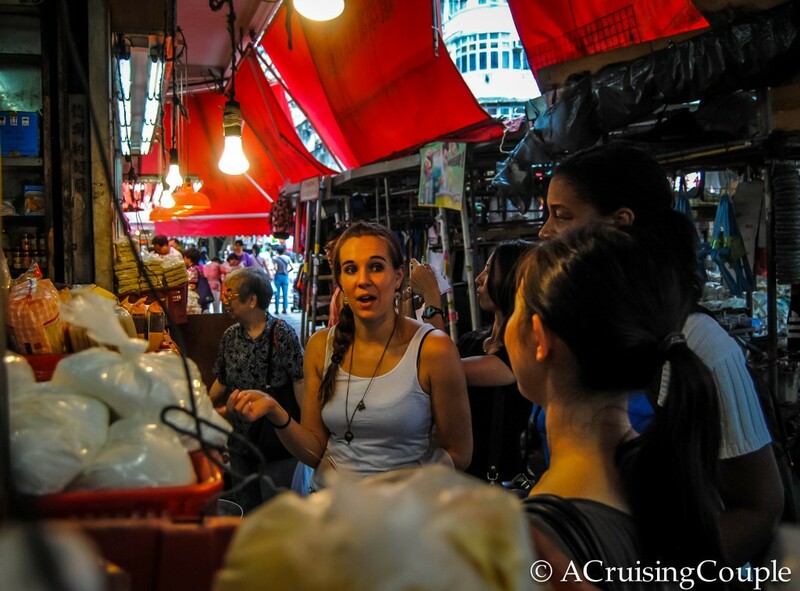 We also spent a lot of time walking past markets and street vendors-even if we didn’t eat there, the tour guides gave us info about it so we could purchase it or go back for it later. We aren’t tour people, but this one was awesome! You’ll have to let us know if you take the tour and what you think of it! Stumbled upon to this travelogue..its wonderful and comprehensive in explaining the local stuff. More than that both of u are so cute…read your story..awesome..